Have you experienced or been accused of fraud? Many attorneys understand the concept of fraud, but which Conroe lawyer will work with you for success against fighting fraud? Fraud is a large category of crimes and carries severe penalties in Montgomery County. Not only does a fraud conviction garner steep legal penalties, but it also carries significant negative social stigmas. Fraud can affect something as small as a friendship or as big as a group of businesses. Furthermore, the consequences that follow fraud can last a lifetime. Fraud is…an intentional misrepresentation of material existing fact made by one person to another with knowledge of its falsity and for the purpose of inducing the other person to act, and upon which the other person relies with resulting injury or damage. Fraud [also can occur in the context of] an omission or purposeful failure to state material facts, which nondisclosure makes other statements misleading. In short, fraud happens when one person misleads or withholding information from another. That misleading or withholding results in personal or financial enrichment of the one at the expense of the other. Ultimately, the root of all fraud is some form of deception. Adoption Fraud: Providing false or misleading information in an adoption processes. Consumer Fraud: Deception that results in financial enrichment at the expense of consumers. Money Laundering: hiding the origin of illegally-obtained money. Transferring that money through legally-established businesses is one way of hiding the true source of that money. Identity Theft: Using the identifying information of another to obtain the financial benefit for yourself. Insurance Fraud: Presenting false circumstances to an insurance company in order to obtain coverage they would not otherwise provide. Tax Fraud: Falsifying records to tax authorities in order to avoid paying the full amount owed. While the above list shows common types in Texas, these are not the limits of fraud. Fraud can also affect marriages, child support, child custody, and business negotiations. If you are a victim of fraud, you should seek an experienced Conroe lawyer to help you through the process. Contact the Conroe Law Office for your free initial consultation. Marijuana concentrates and its shocking penalty group. 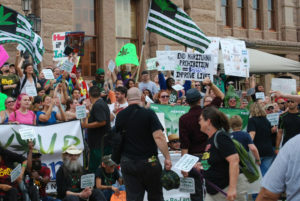 Texas activist march on the State capital espousing “It’s mans right to consume the plants that come from the earth,” known as “natural rights” movement. The Endocannabinoid system, exist in the human body for a reason, but what happens when, that natural plant is concentrated with chemical process to make it concentrated in ways nature never intended? is it still a natural right? The concentration of THC (the active ingredient in a normal marijuana cigarette) is between 13 and 20% normally and normally a person only feels the need to smoke less than 10-30mg to feel a strong high and the desire to consume more THC is sated. The contracted butane resins (at a purity of 70-90%) bypass the desire to stop but supersaturating the body with the compound before the user realizes how much they have consumed, having consumed as much as 600 mg. The real controversy is the penalty group this class of drug falls into. Normally marijuana, which as you may know takes four ounces to become a felony, instantly becomes a fellony when in the form of concentrated oil become a felony regardless of weight, as is treated in the same penalty group as meth. Can I be searched without a warrant? It depends and it’s more complex than you ever would have imagined, especially at the border. Exceptions to the 4th amendments prerequisite to legal search and seizure exist, among such exceptions the “border search exemption” is expected to play a big part in the coming migrant caravan and the surrounding chaos that many illegal importers of illicit substances are looking to take advantage of border security attention being on the group of aliens attempting to cross. Other reasons you can be searched without a warrant exist too. If the time it takes to obtain the warrant, would result in the evidence being destroyed or altered in some way, police are allowed to make a warrantless search. The border officers seem to be gaining power, as more creative criminal activities require more and more right given to law enforcement. Is this a violation of my 4th amendment? Are we living in a police state? The reason exceptions are normally written into law is that higher laws exist, for example, the government has the mandate to control the border, in cases that the border could be in danger in some way, the government argues that the higher law succeeds the lower and it’s really that easy sometimes. In a general sense, the police must demonstrate probable cause. However, this isn’t the case for checkpoints, the U.S. supreme court rules several situations that can result in the setting up of such checkpoints. All the stops the police want-no 4th amendment violation. However, the supreme court has ruled that “general crime control” does not qualify as a reason to initiate a checkpoint. The checkpoint must have a clear aim. To asses the sobriety of individuals, the citizenship status of vehicle occupants, etc. Since local police cannot use traffic checkpoints for drug interdiction, but federal officials can use permanent checkpoints for immigration enforcement, various law enforcement agencies use permanent immigration checkpoints to also look for illegal drugs. The border search exception assists them in this effort. This has led to a wide range of drug seizures, showing evolving tactics among both the people charged with interdicting illegal drugs and those accused of transporting them. These include allegations of transporting marijuana in a van disguised an oil field service vehicle, in a casket in the back of a hearse, and within shipments of local produce. Laws, in general, are kinda complex, exceptions exist and even experienced attorneys many times have to research when I interview people, we spend a lot of time just talking about details because many times the details or some strange exception are just what a person needs to make a strong case as to why the charges need to be dropped.